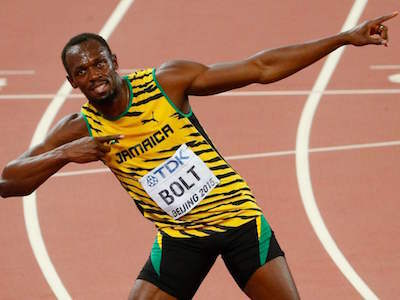 Bolt was born on August 21, 1986 in a small town in the parish of Trelawny, Jamaica, to parents Wellesley and Jennifer Bolt, owners of a local rural grocery store. Bolt’s first love was cricket, which he played with his brother at home. By the age of 10, he began running for his parish in the annual national primary schools’ meeting. Bolt was the fastest runner at his elementary school. In high school, his coach, Dwayne Jarrett, noticed his running skills while Bolt played cricket and encouraged him to try track and field. The former Olympic champion, Pablo McNeil, decided to coach him while Bolt continued to develop his running skills. In his final Jamaican High School Championships in 2003, Bolt, only 17, broke both the 200- and 400-meter records. Bolt hoped to run in the Senior World Championships in Paris, but the Jamaica Athletics Administrative Association (JAAA) refused to let him try out in the finals on the grounds that he was too young and inexperienced. Even though he missed the World Championships, Bolt was awarded the IAAF Rising Star Award for the 2003 season. In 2004 Bolt went professional under a new coach, Fitz Coleman, and ran in the CARIFTA games in Bermuda, where he became the first junior sprinter to run the 200-meter in under 20 seconds. American colleges offered the teenage Bolt track scholarships on the strength of his performances but he refused them all, stating that he was content to stay in his homeland of Jamaica. Instead, Bolt chose the University of Technology, Jamaica, as his professional training ground, staying with the university’s track and weight room that had served him well in his amateur years. At age 21 Bolt ran in the Osaka 2007 World Championships in Japan, winning a silver medal. The Osaka win inspired Bolt to run in the 2008 Olympics in Beijing, China, and just before the Olympics began that summer Bolt had already managed to win the 100-meter world record. By winning the 4 x 100-meter relay in 36.84 seconds, Bolt set a new world record once again at the 2012 Olympic Games in London. He also beat the Olympic record in the 100-meter dash after winning the final with a time of 9.63 seconds, setting the second best record in history. Bolt also triumphed in the men’s 200-meter final, becoming the first athlete to win Olympic gold medals in two consecutive games in both tests. At the 2016 Olympic Games in Rio de Janeiro, Bolt beat the Olympic record yet again by winning three consecutive gold medals in three different sprints, a triple victory. At 30, Bolt remains unmarried and is considered to be the highest-paid track-and-field athlete in the world. He intends to retire from athletics after the 2017 World Championships in London.